I want to start with an apology. As I mentioned earlier, I am developing a new project for Armenia. This project has essentially taken away all the time I had allotted to this blog. While I value this blog, it’s unfortunately not something I can prioritize at the moment. I am still connecting with Armenian politics and hope to be able to comment more in the future, but for now I want to introduce my project. Over the last year of being in Armenia, I recognized that there is huge need among the population. This need varies from humanitarian aid, youth organizations, agricultural investment, etc. If you name it, there is need for it somewhere in Armenia. One can respond in two ways, either that Armenia is a backward hopeless country and will permanently be in need of (primarily foreign) aid, or that Armenia is ripe for opportunity where those with almost any skills imaginable can make an impact. Considering my predilections, I bet you can guess which route I believe in. In fact, how much impact Diasporans can make and how all Diasporans should at least consider contributing to Armenia from within Armenia formed a core part of my talk at AGBU Focus’s Perspectives panel earlier this year. What I can contribute to Armenia are my professional talents. There are people that are more passionate than I am, more knowledgeable about Armenia, more connected with the Diaspora or the Armenian government, but there aren’t many international law and human rights lawyers around who are determined to take on the challenges. So, I set about creating an organization that will promote Armenia’s civil society sector by increasing their efficiency and maximizing their effectiveness. The organization is called Transparency Resource Centre. 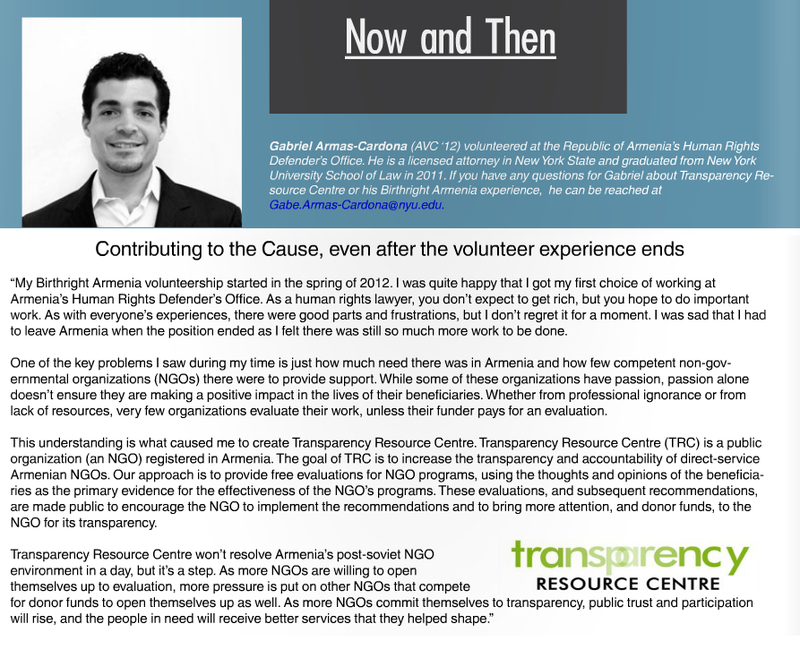 There’s no need for a long introduction to Transparency Resource Centre here as Birthright Armenia recently put a description in their summer/fall 2013 alumni newsletter. For those too impatient to read through the beautifully laid out newsletter, I screenshotted the relevant part below. If you have any questions or are interested in contributing to the cause, post below or email me at Gabe.Armas-Cardona@nyu.edu.